Professional dog grooming is a rapidly expanding industry that provides steady employment for many animal lovers. A career in this field features many advantages for a dog lover, including minimal education requirements, steady work, and reasonably good pay. Dog groomers get to work with dogs every day, which is certainly a big incentive for dog lovers. This is a job with a high level of hands-on contact with the animals. Groomers can also work exclusively with a particular breed of interest if they so choose. Groomers provide valuable health-related services such as trimming nails, bathing, cleaning ears and checking for skin conditions. They can inform the owner of any unusual changes or observable problems with a pet’s health so that these can be brought to the attention of a qualified veterinarian. Groomers have the luxury of setting any work schedule that they desire. While many groomers work mostly traditional office hours, some choose to work part-time or travel the dog show circuit. Groomers are always learning new techniques and skills, whether from practical experience, other groomers, or training clinics and trade shows. New equipment is always being brought to the marketplace, and top groomers tend to take advantage of innovations designed to improve work quality and efficiency. Dog groomers can set their own prices for the different types of cuts they perform, with prices based on the amount of time involved and the technical difficulty of the specific cut. Experienced groomers with a solid client base can demand top dollar for their services. Show groomers working at the national level can earn extremely high pay for each cut. Individual groomers can focus on providing services for a few specific breeds, or in some cases just one particular breed of choice. Alternatively, they may provide services to broader categories, such as working with group breeds or toy breeds. Some groomers specialize even further, providing grooming services exclusively to those in the dog show industry—a particularly lucrative option if the groomer has the requisite skill level. Dog groomers can learn the basics of the trade relatively quickly. Some salons train groomers on the job, but many professional training programs also cover the necessary skills within a few weeks or months of intensive practice. While certification is not necessary to pursue this career path, several certification options can enhance the groomer’s professional credentials. 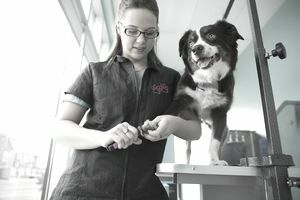 Groomers tend to enjoy working with both pets and people, and they certainly have the opportunity to interact with both. Promoting good client relations can be a key aspect of a groomer’s success. Pet owners may become good friends with their pet’s groomer, much in the same way they tend to become friends with their hairstylist. This can lead to valuable referrals and connections in the local area. The 2018 survey conducted by the American Pet Products Association (APPA) indicated that the pet industry was responsible for $72.13 billion in annual spending in the United States. The pet services portion of the industry, which includes pet grooming, was responsible for $6.47 billion of that total. Spending on pet services is one of the fastest growing aspects of the industry, and this translates to excellent opportunities for dog groomers and other pet service providers. Dog grooming is an extremely accessible option for those wishing to be self-employed. A groomer can open their own salon, or become an independent contractor within an established salon, with a fairly reasonable investment of funds for basic equipment and advertising. Another option that has been growing in popularity is the mobile dog grooming salon, where the groomer purchases a specially outfitted van and travels to client homes to perform grooming services.